Bootie pays tribute to two of the most badass pop stars to come out of the late ‘90s/early ‘00s — it’s Gwen vs. P!nk Mashup Night! 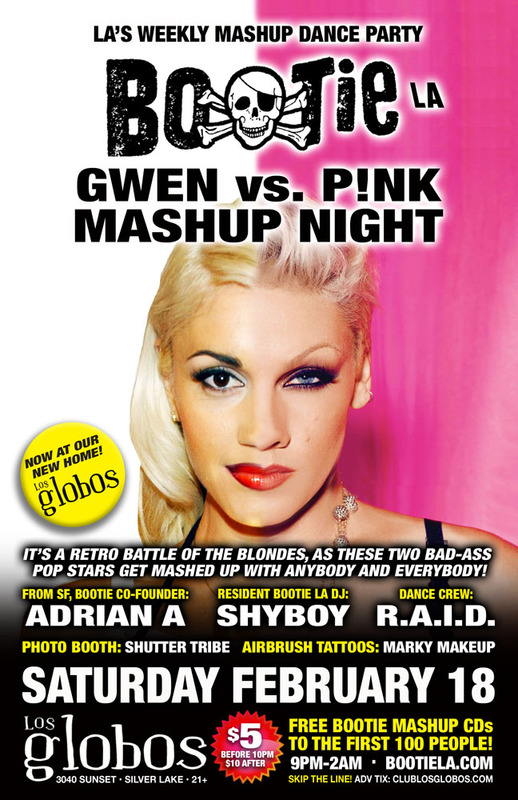 It’s a full-on retro battle of the blondes, as Bootie co-founder Adrian A joins resident DJ ShyBoy in mixing and mashing both Gwen Stefani and Pink with anyone and everyone, making sure no genre or era is safe! Plus resident dance crew R.A.I.D. gives divalicious go-go insanity all night, Marky Makeup airbrushes your favorite artist, and of course Shutter Tribe will be there to capture the party! All this, plus FREE Bootie mashup CDs for the first 100 people through the door!